Now just imagine if that hospital had a Real-Time Location System installed that could deliver 100% location accuracy and real-time information to know precisely whom was in the same room with this employee. Also, think how much easier it would now be on the hospital and the state of Georgia if a reliable RTLS Hand Hygiene Compliance Monitoring system had been in place. 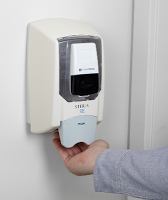 Such a system would have provided the evidence that this employee had (or had not) been hand-hygiene compliant to avoid excessive TB exposure to hospital patients and staff.